At Heerema, our offshore decommissioning execution philosophy is firmly based on five pillars to help customers succeed: Reputation, Capability, Predictability, Flexibility and Responsibility. Our unsurpassed track record of successfully executed, complex, and integrated Engineering, Preparations, Removal and Disposal (EPRD) projects underscores the robustness of this philosophy. We deliver peace of mind, cost-effective and complete EPRD solutions to our customers. Heerema operates its own fleet of semi-submersible crane vessels as well as a large number of transportation barges and tugs. 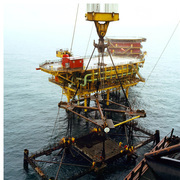 This provides us with access to the most suitable assets for complex offshore removal operations in the harshest of environments. The realisation of an inhouse Simulation Center and the introduction of our new SSCV Sleipnir in 2019 will further expand the offshore capabilities that we can draw on to deliver cost effective and smooth removal operations. 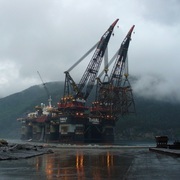 Topsides are removed by reverse installation i.e. 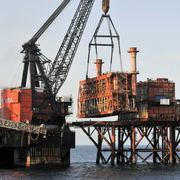 the modules are lifted from the platform and placed on a transportation barge or the deck of the crane vessel. 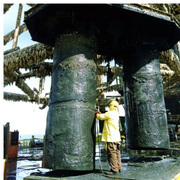 Jackets are prepared for removal by installing lift points, rigging, spreader bars, and other installation aids. Jackets are removed by reverse installation i.e. 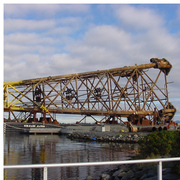 the Jacket is lifted from the sea bottom and placed on a transportation barge or the deck of the crane vessel. 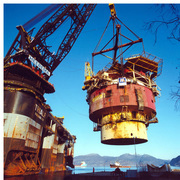 The topsides are transported to a quayside for disposal or onshore storage. Offloading can be carried out by lifting, skidding or by means of trailers. These activities require specialized cutting and soil plug removal equipment. The Jackets are transported to a quayside for disposal or storage. Offloading can be carried out by lifting, skidding or trailers.